I’ve been test driving the new Ford Fiesta Econetic Diesel car for the last few weeks to see if it lives upto it’s claim to save you money because it’s “Australia’s most fuel-efficient car” and whether it is a “green” car in terms of having less impact on the environment than a standard 4 cylinder small petrol car. Lots of people asked me if the Econetic was “fun to drive” and “does it have enough power?”. The answer to both questions is Yes. I did find it fun to drive around Sydney because it handles well, has a lot of low end power and can accelerate quickly. All of these attributes make it very suitable for stop-start city driving. Diesel cars are infamous for having noisy “tractor-like” engines but the new recent model diesel engines like the one used in the Econetic sounds fine, more like a purring cat. I quite like the green light above the engine RPM gauge (tachometer) which lights up to suggest when you should change gears up to drive more fuel efficiently. The Econetic has European style controls. So the windshield wiper control and turning signal indicators are on the opposite sides to standard Australian cars. This meant that the first half dozen times I drove the car I often turned the windscreen wiper on instead of indicating left/right. While this might sound funny to you – it means that people driving behind new Econetic owners won’t be able to tell their intentions because of bad signalling caused by the car’s design. I’m reasonably tall at 6 foot 3″ inches so when I was driving the driver seat was pushed back as far as it could go. This left hardly any space in the back seat for passengers, perhaps a small child could fit but an adult definitely wouldn’t have space for their legs. Ford’s decision to cut the car weight and cost by removing the spare tyre altogether and replacing it with a tire inflator is a bad move for Australia where people often drive a few hundred or even thousand+ kilometres to visit friends or go on holiday. This may put off some potential buyers. The Australian Government Green Vehicle Guide tested the Ford Econetic and says it has an average fuel economy rating of 3.7L/100km for mixed driving, 4.6L/100km in the city and 3.2L/100km on the highway. Here are examples of several different driving trips I did around Sydney in varying traffic and weather conditions using the Ford Fiesta Econetic Diesel. Also as you can see by the average speeds of 25-35km/hr in city traffic I did not drive the Econetic on a motorway at 90km/hr because this loan car didn’t have a Toll Road tag. I’m sure that such a test would have got fuel efficiency numbers down to almost 3.0L/100km. NOTE: During the first few trips I was getting used to the gearbox, acceleration, how the car handled etc so over time I was able to drive the car more economically. Midday on Weekend. 37km/hr. 46.4km trip. Heavy rain. Air conditioning off and windows closed. Peak Hour on Weekday. 27km/hr. 25km trip. Air conditioning on recirculated and windows closed. Lunchtime on Weekday. 23km/hr. 6.8km trip. Air conditioning off and windows open. Lunchtime on Weekday. 26km/hr. 7km trip. Air conditioning off and windows open. Afternoon on Weekend. 29km/hr. 30.7km trip. Air conditioning off and windows open. Afternoon on Weekend. 35km/hr. 26km trip. Air conditioning on recirculated and windows closed. Peak Hour on Weekday. 36km/hr. 24.3km trip. Air conditioning off and windows open. The presenters of UK’s famous Top Gear TV show are famous for disliking diesel cars. 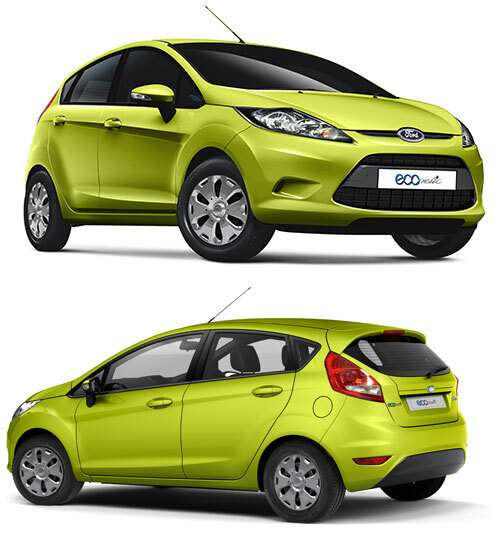 So I was very surprised to hear that they had awarded the Ford Fiesta Econetic Diesel “Least Boring Green Car of the Year” which is high praise coming from them. Interior has a quality feel. Audio and Bluetooth functions can be bamboozling. Shallow rear seat for short trips only. Engine Tall torque figure produces ample acceleration and good flexibility but no auto option could be a deal-killer. Taut steering and a well-tuned chassis combine for a perky, responsive experience. Verdict:Australia’s most fuel-efficient car is also fun to drive, and surprisingly well equipped for a small car. If you were to think that the Fiesta ECOnetic was all about its astonishing fuel efficiency, and nothing else, you would be mistaken. It’s a Fiesta, and it drives like one. That means superb balance, brilliant underpinnings, precision at the wheel, and willing performance. For its purchase price, $24,990 drive away, internal space efficiency (its interior dimensions are not far shy of the Prius), its running costs and inherently simpler engineering, the ECOnetic is a hybrid crusher. We haven’t seen any pricing scales for all-electric vehicles (EVs), but chances are it’s an EV crusher too. Ford has released all the pertinent details: it will go on sale on 1 December 2009, at a price of AU$24,990 drive away, significantly undercutting the AU$40k Prius. Critically for headline writers, it’s been officially rated as more fuel efficient than the Toyota’s hybrid Prius. Peer beneath the bonnet and you’ll find a reworked version of Ford’s 1.6-litre turbo-diesel (66kW/200Nm), which when combined with all the other details nets a fuel combined economy rating of 3.7L/100km — 4.6L/100km in the city and 3.2L/100km on the highway. By comparison, the Toyota Prius has received a 3.9L/100km combined rating in the same testing — 3.9L/100km in the city and 3.7L/100km on the highway. Although the new Prius has the edge in CO2 emissions — 89 grams of CO2 per kilometre versus 98g/km in the Fiesta. The more high economy cars that make their way down under the better, especially ones that are as affordable as this Fiesta. Why would they ruin an otherwise great car by leaving out the spare tyre? What happens if you destroy a tyre miles from civilization? Who makes the decision, someone in Europe who has no idea about Australia, or some cynical manger here, expecting that their typical, often female, buyer here would never think to ask? Seems to me like a pretty nice car. I’ve driven fiesta’s before, so I know the handling is quite nice. This econetic engine does surprise me with it’s efficiency. I mean, why drive a prius, when you can drive this instead? Thank you for this review. We are in the market for a car and this information is helpful. I am looking for a green, long-range capable car for highway, and occasional tar road outback driving. I agree with Justin; no spare tyre eliminates this one, sight unseen. In Australia, the lack of a full-sized spare is unacceptable. I suspect that this requirement will get ever more problematic as all small cars become “world cars”, designed elsewhere and to requirements quite unrelated to user needs, and different to any local needs, anywhere. As an aside, I do not like the styling. One person’s “modern” is another persons “garish”. Ford using a green coloured example for promotion adds to my dislike of this relatively minor aspect. JohnP, I couldn’t see any comment from Justin, but Jason is wrong about no place to put a spare tyre. I had a look in the boot and if you lifted out the polystrene carrier (for the tyre pump and other associated stuff) there would be ample room to fit a full sized spare for outback travel. Be sure to remove it after outback travel as it adds to the weight of the Econetic and increases fuel consumption slightly. Remembering that this car is designed to be extremely frugal. As for….. “world cars”,designed elsewhere and to requirements quite unrelated to user needs, and different to any local needs, anywhere. Really……. Our locally designed cars have spare wheels as standard but 6 and 8 cylinders is all you have to choose from. I suggest you stick with your Holden and be green with envy at a car that can achieve 3.2 litres/100km on the highway. Oh well …. don’t like the green? Cool … there’s a lovely (boring) white and a (classic, everyone’s got one) silver for you to pick from. The lack of a spare tyre … is definitely unusual for and Australian motorist. Works for most Euro cars these days though …. but if you REALLY want one …. its not that hard to buy a rim and tyre for the spare wheel that, as Mark D attests, is fitted to the car. Change doesn’t sit easily to many people …. but move with the times people. I’d rather a Hyundai i30 CRDi…..
It’s a more practical size, has a full size spare tyre & the 1.6 litre engine produces much more torque & power than the Econetic. And it doesn’t use a great deal more fuel in the process….. The difference in economy is huge! 60mpg (imperial) for the Hyundai versus 76mpg for the Econetic. That’s about 26% better. The main point of the Econetic was maximum real world economy (better than a Prius) and the German chassis dynamics make the Fiesta a great steer. My Econetic is fun to drive and put a VERY big smile on my face when I took my 3 sons to QLD and got 86mpg (3.2l/100k). Melbourne to Gunnedah(NSW) 1,115km and there was still 4 litres remaining in the fuel tank. Does your i30 have cruise control, blue tooth with voice recognition and 5 star ANCAP rating or DSC and EBD? Mark D, the reason I was “comparing” them as such is because they have the same size engine. As for the huge difference in fuel economy, I wouldn’t call around 1 litre per 100k’s between the 2 as being huge, assuming we are using the ADR quoted figures. Considering Ford has gone out of their way to chase fuel economy it really isn’t that much, especially when you take into consideration that the i30 weighs over 1400 kilos compared to the Econotec’s 1088. Also consider that the i30 diesel produces significantly more power and torque, has wider tyres and also includes a full size spare, and you’ve gotta wonder how much better fuel economy could’ve been achieved if Hyundai decided to follow the Econetic route and pruned the weight and ran low rolling resistance tyres. Anyhow, for me it’s a no brainer, I’d rather sacrifice a little fuel economy for the extra power & torque, rear passenger space, full size spare, larger boot, rear disc brakes…oh, and the ability to be able to tow a trailer. Just to top things off, Hyundai give a 5 year/unlimited kilometre warranty compared to Ford’s 3years/100,000k…..
Russel, my Bedford bus has a 5 litre petrol engine and so does my mates Holden Statesman. The comparison stops there because one is a pumpkin and the other a hot chili. If you bought a carton of beer stubbies (24) and 6 were missing…you’d say not much difference? The extra torque and power of your Hyundai also has to carry extra weight and in fact the Fiesta Econetic pips it for power/weight and torque/weight. You bought an i30 because it meets your requirements for size and features. I bought an Econetic because it is the MOST fuel efficient car for sale in Australia and fun to drive. Mark, however you compare it, the difference in real world fuel consumption is really bugger all….a whole $1.20/1.30 every hundred k’s….loose change….I’d happily pay that just for the extra comfort and leg room afforded to the driver and passengers. Re your Hyundai horror stories, we both know we could just as easily trot out plenty of Ford nightmare’s too….The Territory and it’s issues with ball joints and brake hoses are just 2 that spring to mind…. Anyhow, like you said, I bought my i30 cos’ it met my requirements and you bought your Econetic because it was the most fuel efficient car in Oz.